It was more than two years ago when I first heard Jai Paul. I heard his song 'BTSTU' at this point - it was in fact released in 2007 - and it was a breath of fresh air. Then there was nothing. A long void of nothing. And then like the old adage where you wait for one bus and then loads of buses arrive, he drops an album. Today, Sunday 14th April. How exciting! Maybe he saw the sunny (and warm!) weather outside and thought that it was just time to release it already. 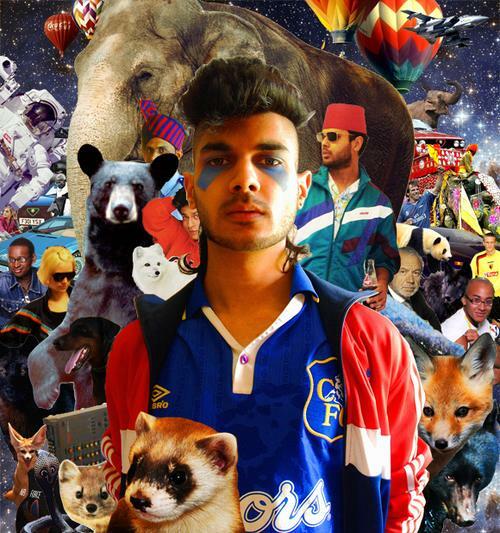 Called nothing more than Jai Paul and with no songs with actual titles, aside from 'BTSTU' (Track 16), 'Jasmine' (Track 9) and a surprise cover of 'Crush' by Jennifer Paige (Track 7), it's a delightful foray into a mad and disjointed world of kooky electro pop. At times it is muscle-bound and distorted, best heard in the clashing clatter of the synth in 'Track 10' and the heavier, more beefy parts of the magical 'Track 16' ('BTSTU' - such a tune; it even has its own Wikipedia page), as well as in the drippy waterfall blips of 'Track 2'; at other times, it is quite the opposite as in 'Track 9' ('Jasmine'), where the synth and beat create a conjugally gentle funk, in the smooth and rhythmic sounds of 'Track 3' with a great low, twisted horn-synth sound in there somewhere, and also in 'Track 7', which is a genius minimalist-funk cover of 'Crush'. There's a guitar solo in that 'Crush' cover that reminds me so much of Prince that I can't help but think that Jai Paul might be a little bit influenced by him. There are yelps dotted around some of the songs that make me think much the same. But perhaps it's just wishful thinking. I got Prince on the brain. The vocals, in fact, suit the at-times strange and off sounds of the album (like in 'Track 4', also in the weird samples - sounds like Ron Weasley - of the first song, and the monster attack of 'Track 8'), with a tone that's purposely unpolished, loaded with echo but filled with soul, too. Dreamy. What else to say? It's a joy to listen to. It's all raw and exciting stuff. The man from Rayners Park, London has made a pulchritudinously squiffy and offbeat addition to the music world with his soft electro funk pop. So damn happy there's more than just a couple of songs floating around now - being signed to XL Recordings should mean only good things for Jai Paul.